Cold Urticaria is an allergy to cold temperatures, where redness, itching, swelling, hives or large red welts form on the skin after this kind of exposure. It can occur even through cold solid objects, air or liquids. The acquired cold urticaria (ACU) is categorized as primary (idiopathic), etiology unknown, or secondary. Patients with primary and secondary cold-induced urticaria is usually idiopathic, on the contrary secondary cold-induced urticaria is associated with other entities such as serum proteins: cryoglobulin, cryofibrinogen, cold agglutinin, hemolysin, or with bee stings, infectious mononucleosis, measles, the human immunodeficiency virus, vasculitis, hypothyroidism, medications such as oral birth control pills and antifungal therapy. ACU usually affects young adults with a mean duration of disease of 4–5 years with remission or improvement in symptoms in the majority of the patients within 5 years. There are very rare subforms of ACU that cannot be diagnosed by cold-contact stimulation tests (CST), as symptoms occur from exposure to unique environmental conditions. It has been suggested that these entities should be classified as atypical ACU. The atypical ACU has been subdivided into delayed cold urticaria, cold-dependent cholinergic urticaria, cold-dependent dermatographism and systemic cold urticaria.Patients with cold-induced cholinergic urticaria develop generalized punctate urticaria after exercising in cold environments while patients with cold-dependent dermatographism urticate after stroking pre-cooled skin. in addition, there are two there are other, very rare atypical subtypes of cold urticaria, which are two hereditary familial cold syndromes: delayed cold urticaria and familial cold auto-inflammatory syndrome (FCAS). Familial delayed cold urticaria is an autosomal dominant disease characterized by pruritic urticarial-like lesions that develop 9–18 hours after cold stimulation that can resolve into hyperpigmented macules. FCAS is an autosomal dominant disease, caused by three different genetic mutations: FCAS1, FCAS2, FCAS3, included in the family of inherited systemic autoinflammatory diseases. With generalized cold exposure, patients develop fever, joint and eye symptoms along with an atypical, nonpruritic, urticarial rash. In affected skin, a neutrophilic infiltration is observed without evidence of mast cell degranulation. The neonatal autoinflammatory diseases include a trio of conditions known as cryopyrin-associated periodic syndrome (CAPS). These are part of a larger category of periodic fever syndromes, but are grouped together because they share a common genetic defect. CAPS consists of Familial Cold Autoinflammatory Syndrome (FCAS, formerly known as familial cold urticarial) , Muckle–Wells syndrome (also known as urticarial-deafness-amyloidosis (UDA) syndrome) and neonatal onset multisystem inflammatory disease (NOMID, also known as chronic infantile cutaneous, neurologic and arthritis (CINCA) syndrome). Cold urticaria symptoms begin soon after the skin is exposed to a sudden drop in air temperature or to cold water. The majority of these reactions occur when skin is exposed to temperatures lower than 4.4 (40F), but some people can have reactions to warmer temperatures. Damp and windy conditions may make cold urticaria more likely. Reddish, itchy hives (wheals) on the area of skin that was exposed to cold. Wheals generally last for about half an hour. Swelling of hands when holding cold objects. Swelling of lips when eating cold foods. In rare cases, severe swelling of the tongue and throat that can block breathing (pharyngeal edema). The worst reactions generally occur with full skin exposure, such as swimming in cold water. A massive release of histamine and other immune system chemicals causes a sudden drop in blood pressure that can lead to fainting, shock and, in rare cases, death. In the case of cold-water swimming, drowning can be caused by loss of consciousness. There are different symptoms in the familial forms: systemic ones are fever, chills, arthralgia, and headaches; instead localized symptoms are skin lesions as erythematous, papular, and burning ones but no urticaria. The ice cube test is the most common and efficient test for this allergy. One simply places an ice cube on the patient’s forearm (volar aspect) for 5 minutes. On removal of the ice cube, erythema is noted and pruritus develops between 2 to 4 minutes and a hive within 10 minutes (positive test). there for 10 to 30 minutes. Cold urticaria symptoms result from the activation of mast cells and subsequent release of histamine and other proinflammatory mediators. Following a cold stimulation test, cutaneous mast cells in patients with cold urticaria show signs of degranulation, and serum levels of mast cell mediators are increased. A lot of proinflammatory mediators have been found to be elevated including: histamine, neutrophil chemotactic activity, tumor necrosis factor, prostaglandin D2, platelet-activating factor-like lipid, eosinophilic chemotactic factors and platelet factor 4. Involvement of various factors and mediators in patients with cold-induced urticaria implies that perhaps the etiology of cold-induced urticaria is multifactorial and the pathophysiology is complex. The exact interaction of the factors and mediators released on cold challenge in such patients is still not quite clear and furthermore every form of this syndrome has a particular cascade in wich most parts are still not understood. being a child or young adult. A type of urticaria called primary acquired urticaria occurs in children and young adults. This is the most common type of urticaria, and it usually improves on its own within two to three years. recently viral infection. Mycoplasma pneumonia and mononucleosis have been linked to cold urticaria. underlying health condition. Known as secondary acquired urticaria, this less common type of cold urticaria can be caused by an underlying health problem, such as rheumatoid arthritis, hepatitis or cancer or linked to gluten intolerance. inherited traits. Rarely, cold urticaria is associated with an inherited condition called familial cold autoinflammatory syndrome This condition causes painful wheals and flu-like symptoms after exposure to cold. There is no cure for cold urticaria, but treatment can help. Treatment includes avoiding cold temperatures and exposure to sudden changes in temperature. Medications can help prevent and reduce symptoms. Antihistamines. These medications block the symptom-producing release of histamine. Some of these medications are available over-the-counter, whereas others require a prescription. Examples include loratadine (Claritin), fexofenadine (Allegra), cetirizine (Zyrtec), levocetirizine (Xyzal) and desloratadine (Clarinex). Cyproheptadine. This medication is an antihistamine that also affects nerve impulses that lead to symptoms. Doxepin. Normally used to treat anxiety and depression, this medication can also reduce cold urticaria symptoms. 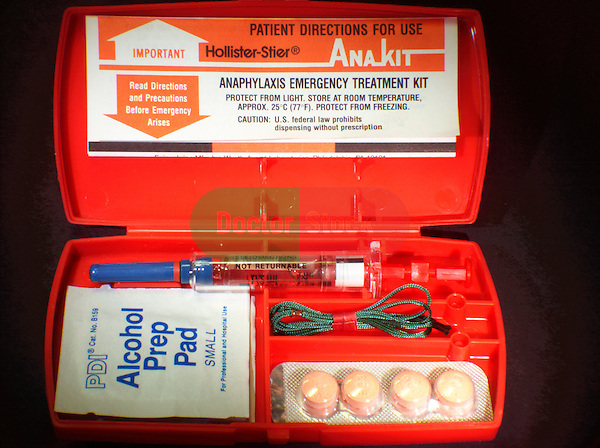 Whatever antihistamine is prescribed, it is important to also prescribe an injectable epinephrine such as EpiPen or anaphylaxis treatment kit (Ana-Kit).